Don't you just love it when your child's teacher sends home a craft/project as homework? Honestly, I figured that the kiddos would make Valentine Boxes or envelopes at school, but we were asked to make them at home this year, and send them in. We got to work on our project early in the week, so we wouldn't put it off until the last minute. I let B choose which type of Valentine Box he wanted to make. We happened to have an unused shoe box lying around the house (thank goodness), so we grabbed it and then got to work. B had a hard time choosing between Darth Vader and Spiderman. I couldn't believe that Spiderman won over, considering how into Star Wars B has been lately! I took to Pinterest (what would I do without it?) and searched for ideas for a Spiderman Valentine Box. I found one similar to the one we made (pictured above). Before I did anything, I cut a slit in the top of the shoebox. Next, we covered the top of the box with red paper, and then the sides of the box with blue paper. We used a black marker to draw spider webs on top of the box. We cut out a little red rectangle, and added two Spiderman eyes to it. Then, we propped it up and secured it with glue, behind the slit in the top of the box. We added B's name to it, and then B decorated the box with his Spiderman stickers. I had also planned to outline B's name in red sparkle glue, but his daddy accidentally sent the box to school with B on Tuesday, before we were quite finished with it. Oh well. It's not super fancy, I realize... but I'm not very crafty, and we had limited craft supplies on hand at home. Plus, I hate to spend a ton of money on something that I know will wind up in the recycling bin in a few weeks. Bottom line, B loved the box- he got to help make the entire project, and was so proud to take it to school with him. I know he'll be so excited to see it filled up with Valentine cards and treats from his school party on Friday. 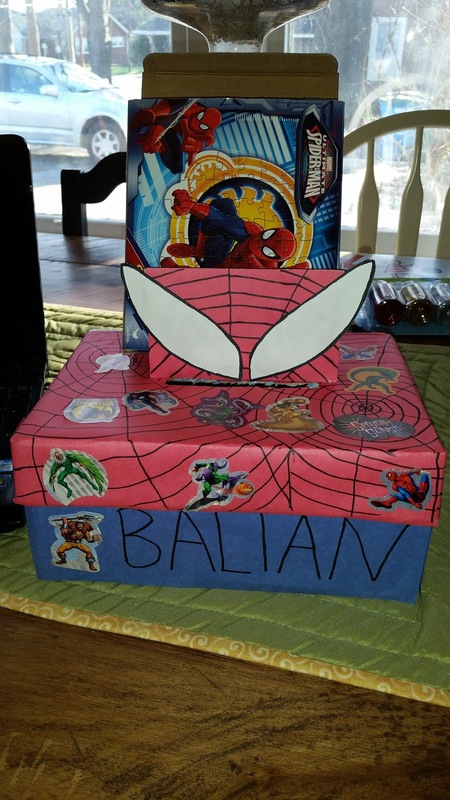 If you have a Spidey lover in your house, and need a box for their class party, stick with this simple design!